“What are you gonna do with them?” he asked. One day Satan and Jesus were having a conversation. Satan had just come from the Garden of Eden and he was gloating and boasting. “Oh, I'll kill 'em,” the serpent hissed proudly. God sent Jesus to earth. While on earth, Jesus performed lots of miracles; healing the sick, bringing the dead back to life, etc. He IS the Son of God, and he is perfect. BUT the religious leaders of the time thought Jesus was lying and were so suspicious of him that they crucified him on the cross. And these are the RELIGIOUS. LEADERS. Ironic, eh? Three nails – about four inches long with a diameter the size of a nickel – were used to hang him on a wooden cross; one in each hand and one through BOTH of His feet. Here’s a fact: you don’t die on the cross from blood loss, although that IS a factor. You die from suffocation. It takes a lot of effort to push your chest up for every breath you take when all that’s supporting you are your hands and feet. And Jesus hung there for 6 hours. 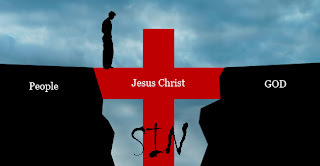 When Jesus hung on the cross, the entire world’s sins were laid on him. Sins are, to put it simply, bad things committed by humans against God; lies, murder, stealing, cheating, adultery, greed, etc. EVERYONE has sinned. And the consequence of sin is eternal death. But Jesus, well, you could say that he took responsibility for all our sins. He did it for you, me, and the whole world. So instead of US dying and going to the fiery pits of hell because of all our wrongdoings, Jesus went there for us. And by doing that, God forgives us. When He sees that we believe in Jesus wholeheartedly and that he died for our sins, the gates of Heaven are wide open, and, through Jesus, we can spend eternity there. I am always awestruck by this story. To think that God loves all the people in the world - you, me, EVERYONE - that He sent Jesus to DIE, it's almost unbelieveable that we're so important. But we are! And the story doesn’t even end here. If you want, come back to this blog later to find out what happens next.